Welcome to the official website of GUILTY PLEASURE "New England's Premier Dance Band"
Please pardon our appearance temporarily. Our website is currently under construction while we prepare to launch a brand new website coming soon. GUILTY PLEASURE has been one of the Northeast's most popular wedding-function bands since 2003. We provide the best variety of Motown, Soul, R&B, Funk, Disco, Top-40 and current dance hits. For dinner music we include classic Standards, Ballads, Duets, Swing & Lite Jazz. GUILTY PLEASURE is available for Weddings, Corporate Events, Private Parties, Clubs & Restaurants, Concerts, Casinos, Fairs & Festivals. 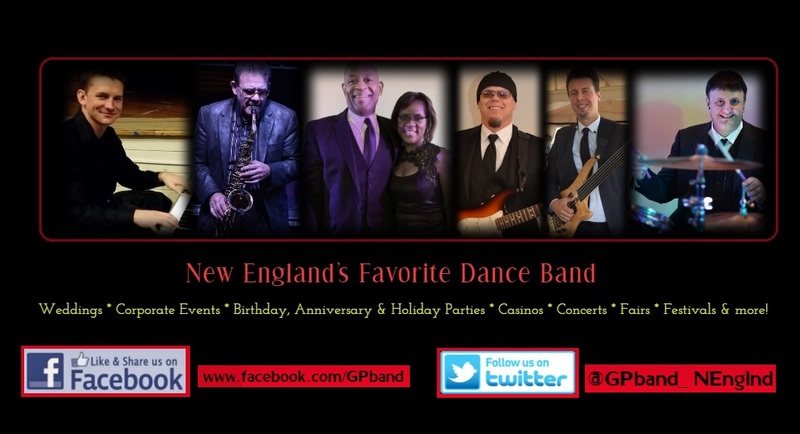 The band features both male & female vocalists accompanied by some of the area's finest musicians and continues to provide the very best professional live dance music in New England. Until our new website is ready please visit us online! If we're unavailable please leave a message with the best time to reach you. We will return your call within 24 hours! Band starts at 9pm. No Cover! "Once I saw Guilty Pleasure live at a local club... WOW!! ..Their energy, their musicality, their ability to get the crowd dancing.. we knew we had to hire this band! Almost two months after our wedding, we are still getting compliments about how great this band was. Some of our friends who have been to dozens of weddings (some of which had those $8k+ bands) say it was the best wedding band they've heard. Our guests were dancing the whole night, and Guilty Pleasure played the PERFECT assortment, from Motown to Bruno Mars. There was something for everyone. I also paid a very reasonable amount to have two of the band members play at cocktail hour before the reception, and even the "background music" got rave reviews. "Hiring this band was one of the best decisions my husband and I made." "We cannot thank Guilty Pleasure enough for doing such an amazing job with our wedding. Guilty Pleasure absolutely surpassed our expectations. We had numerous people come up to us and tell us that GP was the best wedding band they had EVER heard, including close family friends who owns one of the larger catering companies in Houston (and who have done TONS of weddings). From the ceremony to the reception, everything was just perfect. Guilty Pleasure had everyone dancing all night long. On top of that Chris (bandleader) was so great to work with leading up to the wedding - incredibly kind, accommodating and attentive. All (and I mean ALL) of our special requests (which was not a short list) were fulfilled. Thank you!!!" "Guilty Pleasure Band was amazing. They learned three songs for us and were very responsive to our vision. The bandleader Chris was easy to talk to and make arrangements with. We were planning our wedding from across the country so we had a three hour time difference but he was always flexible and understanding. They have such an classy band, the music was incredible and they did an amazing job. Our guests danced the whole evening, just as the band had promised, and our guests raved about the music! They assessed the crowd and played songs accordingly. They're truly a great band and were a wonderful vendor to work with. We would highly recommend them to anyone getting married!" "We hired Guilty Pleasure for our fundraiser this past weekend based on some very positive word of mouth. Not only did they prove to be a talented group of musicians but also a great group of people who brought the house down! They exceeded any expectations and our members are still talking about how much fun they had dancing all night. We were all overly impressed and will definitely recommend them to anyone in a heartbeat." "Just wanted to thank you and the band for a really professional job. Great sound, great selection and just such a positive vibe. People have been buzzing about how good you guys were, they already want me to book you guys back again for 2017. Thanks Again!"